Planning a wedding on a small budget? It may seem like an impossible feat, but it can be done with a little creativity and planning. Here are five more ways to save on your wedding budget. Don’t forget to check out the first part of this series: 5 Ways to Cut Your Budget Before You Cut Your Cake. Cut Invitation Costs: If you have a color printer, than you are one step closer to saving hundreds of dollars on your invitations, thank you cards, and other paper crafts. There are so many software programs available that allow you to print your own beautiful invitations. These programs are built in with templates so all you have to do is add in your name, the date, and location and print it out. A great website to look into is Uniquityinvitations.com. This site offers elegant downloadable templates for only $79. Etsy.com also has several elegant options that can be customized, downloaded, and printed. Once the template is downloaded, all you have to do is fill out the correct information and print as many as you need. This was is even simpler than finding an invitation making computer program! Plus, you can print as many invitations, save the dates, programs, and RSVP cards as you need, without the cost going up. Cut Photography Costs: Photography is one of the most important aspects of any wedding, hands down. Beautiful pictures do not have to absorb your entire budget though. To save on your photography expenses, you can choose to go all digital. Buying only the proofs and a CD of all the photographs will save you a lot of money. With these two things, you can then print only the pictures you love at places like Wal-Mart, Costco, or Sam’s Club. Another way to cut costs on your photography is to hire professional family members or friends, photography students at a local college, or a new professional needing experience. Always asks to see portfolios. However, be warned that many people are aspiring wedding photographers now. Look for those who have taken classes, especially in editing. Ask them specific questions about the camera and programs they use. Likewise you can save on printing if you invest in a colour laser printer, then you can cut out the middle man! Cut the Cake and Its Costs: Two aspects go into a wedding cake: taste and look. Usually when couples are on a tight budget they feel that they have to sacrifice one for the other. One idea to save money on your cake is to buy a small but elegantly designed wedding cake. This cake will look beautiful in photographs. However, it will not feed all of your guests. This is where sheet cakes come in. Sheet cakes are delicious and very cheap. Another way to save money on your cake is to have the baker decorate a fake layer. This will make the cake look significantly larger and keep the cost significantly smaller. Some people decide they are not cake people and set up an array of cookies and cupcakes. There have even been cakes made from doughnuts! Cut Decorating Costs: I am all for a beautifully decorated wedding, but how many times does a bride put too much thought and money into the little details that do not really matter? 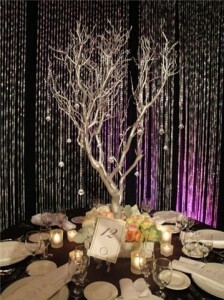 An easy way to cut costs when it comes to decorating is to find simple ways to make the decorations yourself. Of course, no couple wants their wedding to look cheesy. It seems very popular right now to have simpler outside weddings that use mason jars and candles and tissue poms as decorations. Also, many brides have decided to decorate with wild flowers instead of the pricey flowers of the season. For my own wedding, I wanted the look of elegance to still remain. 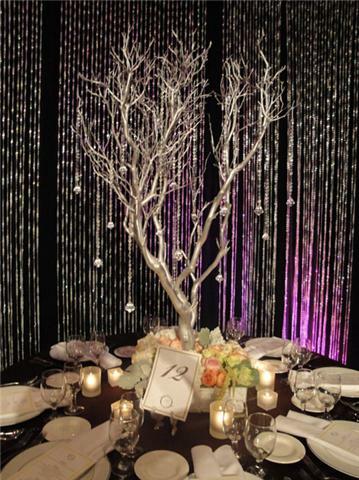 One way I saved was to have Manzanita trees decorated with candles and dangling rhinestones (similar to the picture above). It worked out well for my fall wedding, and my cost of flowers was only for the bouquets. Also, I found ways for the ceremony decorations to be reused at the reception, making my decoration budget go further. The best investment I made towards decorating costs was about $350 towards the use of up lighting. Up lighting can come in several different colors and adds a softer light to the wedding area. Since I spent the money for a more romantic lighting, I was able to save money on the location and chair rentals/covers. The room and chairs had a conference room look to them, but the up lighting really did wonders to hide it. Other Ways to Cut Costs: The high season for weddings is from May to August. You can save a lot of money just by having an off-season wedding (with the exclusion of December). Also, having your wedding on a weekday will also save a bundle of cash. Typically a wedding is on Saturday, so planning for another day will save you money and get you the ceremony and reception sites you want. If you are trying to plan a wedding on a budget, remember that this is your special day, and you do deserve to enjoy it. Decide with your partner what the most important aspects of the wedding are. Put more money aside for those aspects of the wedding and save money on the unimportant factors, such as favors or the cake. Finally, some vendors may offer a discount if you pay in cash instead of credit card. It does not hurt to ask! Car Insurance Groups: Where do you fit in?